Out of more than 5,500 colleges, Pensacola State College is on the list of Top 100 Associate Degree Producers, according to Community College Week magazine. This is the eighth straight year Pensacola State has received this national recognition. Two-year and four-year institutions, both public and private, that award associate degrees were examined for the Top 100 list. The ranking is based on data collected by the U.S. Department of Education’s National Center for Education Statistics in the 2014-2015 academic year. In the Sept. 20, 2016 issue, Community College Week puts Pensacola State 79th overall in awarding associate degrees in all disciplines, non-minority. Additionally, the college ranks 34th in the specialized Top 50 list for granting associate degrees in registered nursing, nursing administration, nursing research and clinical nursing. PSC President Edward Meadows points out that a successful career path often starts with an associate degree that can be earned in just two years. Depending on a student’s career goals, an associate degree can lead to a bachelor’s degree or can lead directly to a high paying career, especially in technical and health fields. 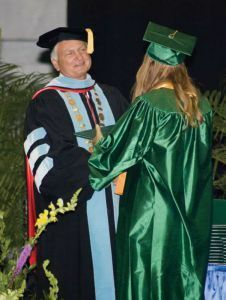 “Pensacola State does more than offer exceptional programs,” President Meadows says. “Our college provides the caring faculty and counselors, technical resources, and financial support that students need to complete their degrees.